This breakthrough in anti-aging technology is a well-kept celebrity secret, and has been featured on Queer Eye For The Straight Guy and Oprah. Microcurrent therapy is a procedure whereby minute amounts of electrical current are passed through the skin to the tissue below to revitalise it. In this way, non-surgical facelifts can be performed, wrinkles reduced and the elasticity of the skin replenished. So how can a machine sending electrical impulses perform the aforementioned beauty miracles? The human body is made of about 70 per cent water, which facilitates its operating on electrical impulses. These impulses are micro currents very similar to those put out by Bio-Therapeutic Computers machines. In fact, our brains can’t even detect when micro current therapy is being applied. The human body doesn’t want a high impact action. High levels of current would be invasive and the body would resist – respectively it’s kind of like getting a hug as opposed to getting a hard slap. The cells surrounding our faces are subjected to a lot of abuse in terms of stress, pollution, eating, etc. The face’s muscular structure is complicated, and the abuse it receives causes some muscles to shorten and others to lengthen after which they freeze up in place. This, aided by gravity, causes a droopy face as the skin can no longer hold the muscles in their proper places. Stimulating the muscles to work is Adenosine Triphosphate (ATP), and it is the levels of ATP that are adjusted by the micro currents producing a biological chemical effect. Most people have a Ph balance of about 7.4: a balance of alkalinity and acidity. Lack of exercise, excess greasy foods, and a myriad of other problems can cause an imbalance. By neutralising Ph levels in the face’s 18 groups of muscles, circulation is improved, which hydrates the muscles allowing them to relax and move naturally again. It’s like ironing the wrinkles flat. The face then lifts on its own and fat deposits and H2O deposits are drained away during the therapy. It is described as re-educating the muscles, literally changing the physiology. The indirect effect is that it tricks the body into doing the job it’s supposed to in the first place. Bio-Therapeutic, Inc. is the world leader in anti-aging technology, providing the most cutting edge, age defying technology available today. The company is a FDA and ISO registered device manufacturer and all equipment is safety tested and UL/CSA listed. Ongoing clinical trials with the University of Washington ensure proven efficacy and results. Micro current therapy is FDA approved in the US and CSA approved in Canada. In other words, it’s a very safe therapy. Clinical studies have shown that after 20 days of treatment, collagen production increases by 14%, elastin increases by 48%, and blood circulation increases by 38%. 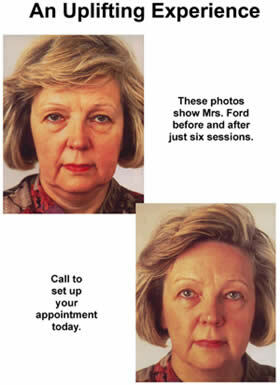 The microcurrent facelift procedure itself takes approximately one hour to complete. A microcurrent facelift specialist will use a two-pronged cotton-tipped instrument to gently deliver electrical stimulation to the muscles and tissues. 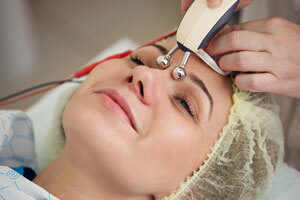 The microcurrent facelift requires no recovery time and no downtime. Ten to twelve treatment sessions are recommended. Follow up treatments are performed 3 – 4 weeks apart, to maintain microcurrent facelift results. Your information is safe with us and will never be shared. I find this is a very good service and I am very pleased with the results. Everything is to my satisfaction. Shelly’s personality is great. I have enjoyed the kind, pleasant service from Shelly. She is always ready to help and offer advice, keeping me up-to-date on the latest products and treatments. I’ve been to a lot of electrologists in the past 15 years and I find Shelly very professional and the quality of her work is very effective. I have had electrolysis and am very happy with the treatments I have had. The results have been great. 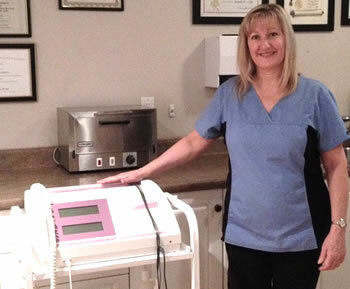 Shelly is very professional and her office and treatment room are always meticulous. I have been to see Shelly for some time now. I am pleased with what she has done for me. No more tweezing! Always on time. Accurate estimates for amount of treatments. Clean, professional, nice atmosphere. Kind staff. Loved the results of vein treatment on my face. Laser hair removal on my face is great. Very professional, gentle, and attuned to my needs. The environment is clean and comfortable. Treatment always meets my expectations and is reasonably priced.